Before I knew, then there were three. Males and females began showing up. Hey, I was here first. Please don't push! Love the pretty Goldfinches! Beautiful mosaic and a cute poem! Enjoy your new week! We haven't seen any goldfinches around our thistle feeder comoared to oast years. Yours provided a lovely view, JP. I'm so glad I stopped by to see this sweet post. I love your mosaic. It is so unusual and just looks amazing! Beautiful little finches....they haven't shown up here yet. Very cute poem. and I can just imagine them flying in one after the other! You did a lot of work on the collage, it is brilliant. 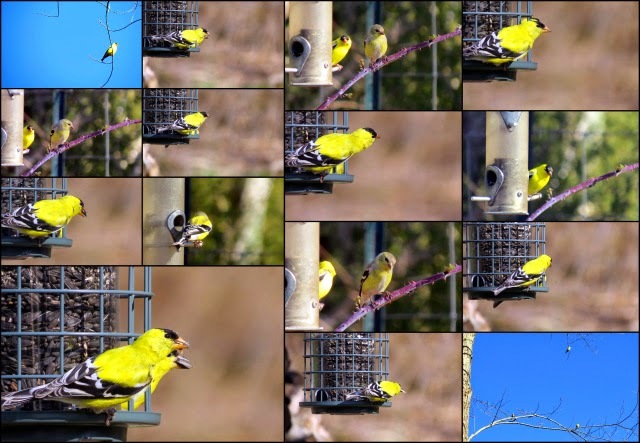 I love Goldfinches and I love your poem. A sweet poem for many sweet birds. How great is that? A perfect verse for a bird that really does say spring and summer too!! Beautiful! I certainly did smile. I have Goldfinches galore and they are so sweet and pretty. They make me smile each day as I sit and watch them flurrying from one branch and feeder to another...sometimes as many as 5 at one time on a feeder. Loved you little poem. It brought a smile to my face this morning. Such a nice post.